Summary: Great looks are a given with Nordic Track. What makes the 11.5 Nordic Track Elliptical Cross Trainer stand out is what is under the ‘hood. You’ll get the ‘SMR’ which is an innovative technology solution for Silent Magnetic Resistance. You can also adjust incline, along with intensity. This gives you a lot more flexibility with your workouts than with a regular cross trainer. Topping it off, the console is way better than you’ll find on most home models. Check out the gallery and feedback from previous buyers on this dedicated amazon.co.uk product page now! You’ll get a good-looking unit with the 11.5. The combination is metal, greys and blacks – along with distinctive Nordic Track styling. This gives the overall impression of a professional piece of kit. If you see it alongside the plastic type budget models – there really is no contest. This elliptical is bigger than many models, though not as large as those you will find in commercial gyms. It does not quite fold up, though the back (with the flywheel) does move closer to the front when not in use. The stride length goes all the way to 22 inches. This makes it fine for bigger / taller users (smaller users are fine!). The max user weight is 150kgs. Your primary resistance comes from a big 9kg fly wheel. There are 20 resistance levels, which are magnetic. On cheaper elliptical cross trainers, you’ll need to stop and turn a dial. Nordic Track are way above that level, your resistance is controlled via the console. In addition to 20 resistance levels, you can switch up the incline. This adds a bigger effect than you might realise, in a similar way to a treadmill. Try combining longer strides, more resistance and an incline, and you’ll feel the burn! 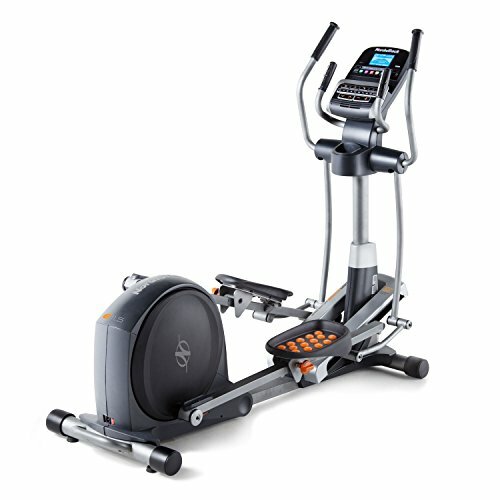 You get to be part of the iFit Live community with this elliptical. There are many benefits, including a tool powered via Google Maps which lets you train interactively. You can use an iPad to train (virtually) outside. There are 30 built in workouts which are tailored to goals – for example calorie burning. This Nordic Track Elliptical is also compatible with POLAR sensors, including their chest strap. There are heart rate monitors built into the handles. This elliptical is compatible with iPods / Mp3 Players too. Speakers are built in to the machine. Last, though not least! There is a giant built in fan to keep you cool during those intensive HIIT workouts. What Previous Buyers Said About the Nordic Track E 11.5 Elliptical Cross Trainer? Not too much feedback to go on for this model. This is standard above the budget end goods. As you’d expect for Nordic Track machines, the feedback is excellent overall. Specifics mentioned include the fact it was easy to assemble, and can be used outside. This is not waterproof, so make sure you do not leave it there! It was noted that this is bigger than most ‘cheap and flimsy’ cross trainers. The folding aspect does help with this. Wrap Up: Worth the Extra for a Nordic Track Cross Trainer? For a few hundred extra, you get a compact version of a pro-level cross trainer. There is no doubting the good looks of this machine. It is the spec which makes it stand out. iFit and POLAR compatibility, SMR resistance for a quiet ride, and incline adjustments all come as standard. After that you have those little extras which make a big difference to your workout. A fan, adjustable pedals and the ability to partially fold the unit are included. Check out the full gallery for yourself, this is a Cross Trainer that would look great in anyone’s home gym or spare room!